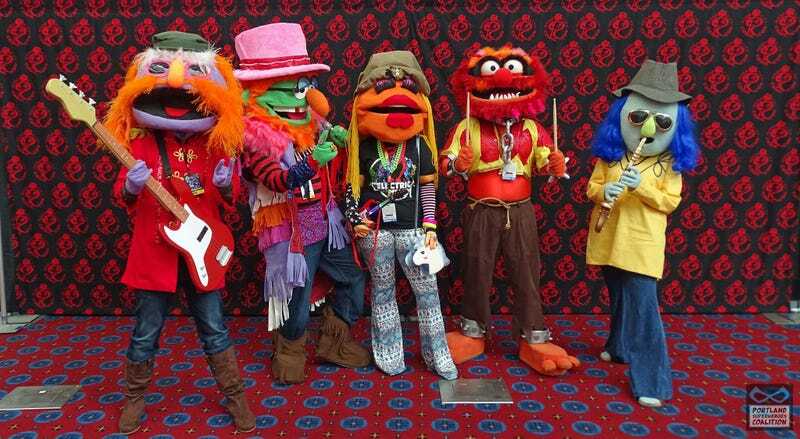 Here’s the latest effort from the Portland Superheroes Coalition: a complete, life-size recreation of Dr. Teeth and The Electric Mayhem, the house band for The Muppet Show. Dr Teeth is Paul Lamoreau, Janice is Kaitlin Lamoreau, Animal is Josue Garcia, Zoot is Sandy Iwata, and Floyd is Jamie Iwata. The gang were in attendance at the Rose City Comic Con over the weekend. Between shows, though, the Coalition does great work, spending a ton of time visiting sick kids in hospital dressed as their favourite heroes.